Though many view Eastern Red Cedars, (Juniperus virginiana), as weeds in abandoned sites, we love the native Cedar for its sturdy evergreen structure in the landscape. 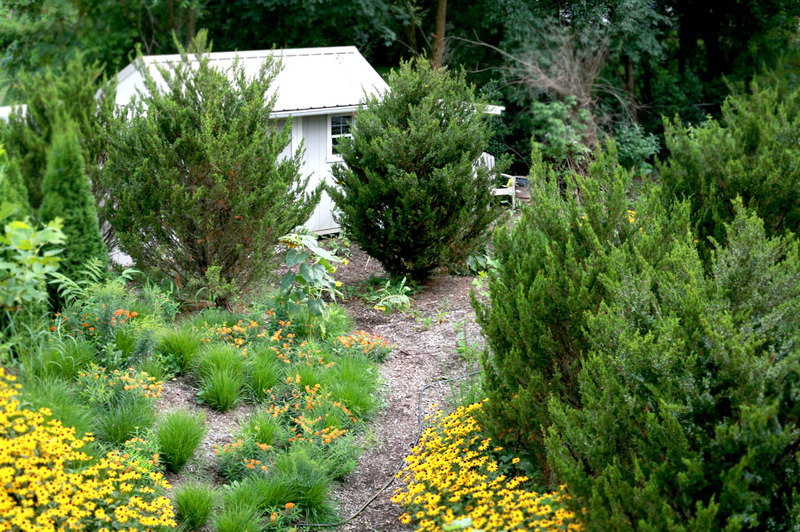 In our native plant landscape designs, here at The Natural Garden we use Red Cedars as a dense native hedge or scattered in groups in savanna and meadow plantings. As early successional pioneer species, they grow quite quickly and are greatly adaptable even in poor and dry soils. They thrive in full sun to light shade conditions and can also tolerate occasional flooding and wet conditions– they can grow almost anywhere in Virginia, even happily from a sheer rock quarry cliff! They create great nesting cover for birds and the berries provide food for wildlife. The Natural Garden nursery carries the straight, (non-cultivar), Cedar in containers. Red Cedars can vary slightly in character according to the individual genetics of each tree creating thousands of sub-species. By using the straight species, we keep the natural genetic variation that is found in nature. Cultivars such as ‘Burkii,’ which is slightly blue, or ‘Taylor,’ which is very upright, are available at some nurseries and are great if you need them for a specific landscape purpose. 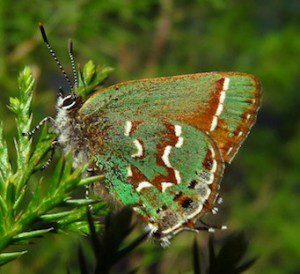 Red Cedars should be planted in warmer months when they are not in danger of freeze damage. Freeze damage occurs when the needles become desiccated from wind and winter sun, while the tree is not able to replenish moisture because of frozen soil conditions. Planting in warmer months is ideal, though care to water consistently should be taken in midsummer until the trees are established. This could be anywhere from February until October, depending on your area, and gives the trees time to root out before winter. Cedars grow fast! Be sure to place them at least 4 or 5 feet away from a building space them at least 6 feet apart, but consult with a nursery professional or landscape designer for your specific situation. Cedars can grow anywhere up to 50’ but here in the Shenandoah Valley we typically see them around 25′-35’ unless they have avoided the chainsaw and then can reach the more rare 50′. We’ve used large balled and burlapped trees on projects, but you’ll see a more steady growth when starting with a 1 gallon or 3 gallon tree, and you can use the money saved to buy more native plants! A client wanted full privacy in her backyard and wanted to create a garden that was a bird sanctuary. The large Red Cedars we installed provided instant year round privacy as well as cover for birds. 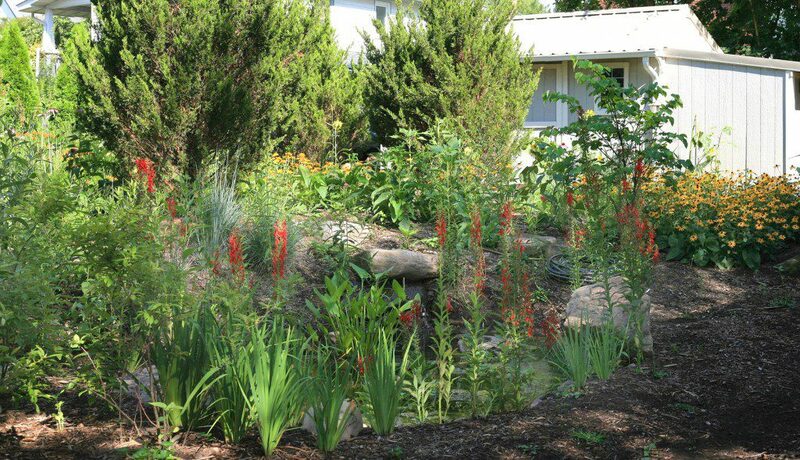 We planted a diversity of flowering perennials and grasses to create a rain garden and a savannah style meadow landscape. I enjoyed seeing the garden created by Augustina and reading her article. It was informative. The garden reminds me of a wood clearing one might come upon on a walk. Hopefully, the owner was appreciative and is enjoying her little bit of heaven! As a homeowner, I when I found little volunteers of this cedar, Juniperis virginiana, I moved them to a holding area where I could grow them on. After about 2 years, I had 2 declining Leyland Cypresses removed and transplanted 5 of the cedars, now 4 feet high, staggered 5 feet apart in the area. With a front of native perennials, I am looking forward to seeing this bed mature. Marjorie, what a delightful story! Thank you for taking the time to tell us about it. Best of luck with your native plantings! In southwest VA I have too many on my farm,as is typical of this area.The seeds are readily eaten by birds and transplanted readily along fencelines as it is a prolific grower. I control them by bush hogging. They are also the carriers of the strange orange jelly fungus called cedar apple rust, the plague of many apple varieties. Beware when planting. How can I tell if the volunteer cedar in my yard is a native red? What a wonderful article! Thank you so much for shedding some light on this often-maligned tree. Like another Commenter I too have a farm in SW Virginia which is inundated with Eastern Red Cedar, actually a juniper. Tho’ friends & neighbors make derogatory remarks about all the little seedlings, I was reluctant to kill them. Now I too will plan on transplanting some of the pretty little trees to spots which could use some nice greenery. With all the dry shade in our forest margins, it’s nice to have a drought-tolerant conifer so readily available. Thanks for this post. I just bought a new house and would like to enhance my backyard screening (and habitat services) but with straight natives, of course. 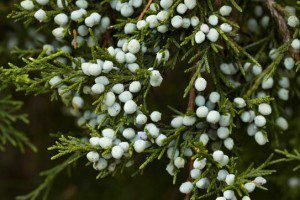 I’m thinking Eastern Cedar vs. American holly because of its fast growth, but am interested in any feedback. Much of the fence line that I want to fill in is topped by a large beech, for what that matters. We’ve got red cedars here and there in our yard. Planted by critters, I’m sure! any type of fir tree.